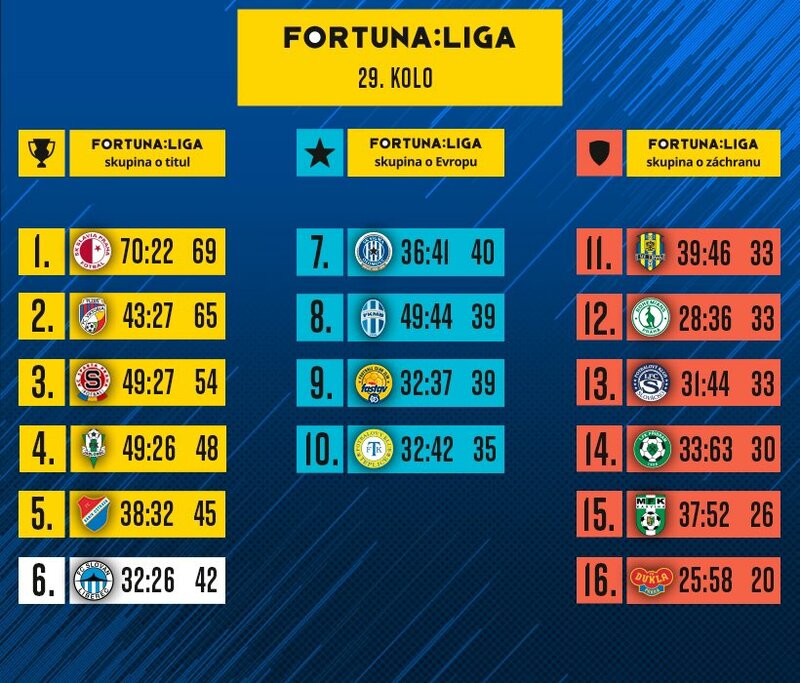 The 24th round of the FORTUNA:LIGA brought an interesting match between Sigma and Slovan, who were separated by only 3 points heading in. Slovan had several chances, but did not take advantage and Olomouc cashed in on their mistakes. Although Libor Kozák cut the deficit in half late, it was not enough to get any points. SK Sigma Olomouc: Buchta - Chvátal, Beneš, Jemelka, Vepřek - Zahradníček (90. Lalkovič), Houska, Kalvach, Plšek, Texl (61. Falta) - Nešpor (87. Yunis). FC Slovan Liberec: Nguyen - Koscelník (68. Oršula), Mikula, Karafiát, Hybš - Potočný, Breite (C), Oscar, Pešek (46. Malinský) - Sýkora (57. Musa) - Kozák. Goals: 30. Beneš, 55. Nešpor - 86. Kozák. Referees: Orel - Nádvorník, Mokrusch. Yellow cards: 73. Kalvach - 50. Potočný, 66. Hybš. In the first few minutes of the match, both teams battled mainly for the middle of the field without any major chances. The first shot shot toward the goal came from Oscar, but it was blocked by a defender. A few minutes later, Sýkora worked the ball nicely with Koscelník, the right defender advanced from the angle to Buchta, but he still chose the pass under Breite - but the player was fast and there was no shot. With a great press from Liberec, Breite centred for Kozak, but he couldn&apos;t hit the empty net. At the other end, Olomouc created two chances, but in both cases our defence responded well - first Hybš and then Mikula managed to clear the ball out of danger. In the 20th minute, again it was Slovan, namely Sýkora and Kozák, who created a chance for Breite, but Jemelka deflected the ball away with his foot. In the next sequence, Oscar Kozák appeared almost alone in front of the goalkeeper, but Buchta was able to run out and get a hand on his shot. Olomouc also threatened after some time, and our defence turned the first chance out of bounds. Zahradníček took the corner and found the head of Vít Beneš, who made no mistake and rippled the mesh to put his team on the board. In another dangerous situation, Kozák found himself headed for the left post, but Buchta made a great save. In the 41st minute, Sigma had a second corner and threatened again. Nešpor got to the ball, and fortunately Nguyen managed to react well and clear the ball out of danger. The home crowd was not impressed by the fancy moves of Olomouc when Nešpor slipped through the defence on the right to come in alone. Slovan tried to pull even at the beginning of the second half, but Olomouc defended well. Slovan, on the other hand, left openings and one of them was used by Zahradníček, who found Martin Nešpor at the near post. Reacting quickly, the attacker shot the ball under the crossbar. Malinský could have answered quickly, but Oscar one-timed his pass off the post. Nguyen then knocked the ball to the corner. Although frustrated with being down by two, Liberec refused to quit. Coach Hornyak rolled the dice and sent three offensive players into the game: Malinský, Musu and Orshul. The first man was able to send a bomb down from one of the corner kicks that was just above the crossbar. In the 80th minute, Potočný took a nice shot, Oršula got his head on it but sent the ball just above the Olomouc goal. Finally, Karafiát drove from long distance, Bucht bobbled it and Libor Kozák did not hesitate this time, depositing the loose ball into the goal. In the end, there was hope for the visiting side because the video was reviewed for a possible foul on Kozák, but the referee did not give a penalty. Slovan didn’t get another chance and lost 2-1.